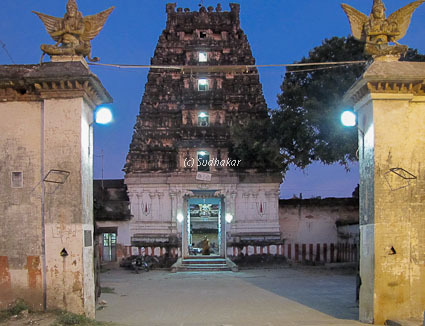 Sri Pavala vannan temple is one of the 108 divya desam temples situated in Kanchipuram. 500 metres opposite to this temple is another temple called Sri Pachai Varnar ( calling the Lord Sri Narayana as green toned one) temple. Though this temple has not been revered in Mangalasasanam, it is beleived that both these to be visited togerther as both these constitute the divya desam. It is explained in the scriptures here that Pacchai vannar, who is also called as "Maragatha vannar" is the amsam ( a form) of Lord Shiva and Pavala Vannar as the amsam of Parvathi. It is beleived that by worshipping these two sthalams at the same time, we worship both Lord Shiva and Parvathi( or Parashakti). The Moolavar of this sthalam( Sri Pavala vannar) is Sri Pavala Vannar Perumal. Other name is 'Paramapatha Nathan'. Moolavar is in standing position facing West . Prathyaksham for Brighu Maharishi, Aswini Devathai and for Parvathi. Thayar of this sthalam is Pavalavalli thayar. Temple location It is situated as you enter Kanchipuram from the main road near the railway station. Kanchipuram is around 75 kms from Chennai off the Chennai- Vellore/ Bangalore highway via SriPerumbudur. Kanchipuram is well connected by several bus services from Chennai. There is a railway station in Kanchipuram with a few train services from Chennai in the mornings. Other interesting places around Kanchipuram It is a temple town with 15 out of the 108 divya desams spread around here. 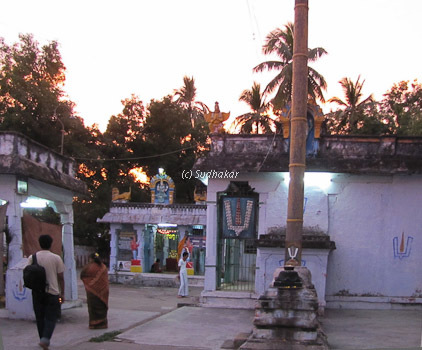 Sri Perumbadur, the birth place of Sri Ramanujar and Rajiv Gandhi Memorial are nearby. Best Season: Throughout the year. Summer( from May to July) could be very sultry when the mercury shoots to 40 degree celsius.